Between 1700 and 1866, the Austrian Habsburgs skillfully navigated the great power politics of Europe, withstanding would-be hegemons Louis XIV and Napoleon Bonaparte, countering the perennial pressures of the nearby Prussian, Ottoman, and Russian Empires, and repeatedly dousing the sparks of revolutionary upheaval. They achieved this, according to A. Wess Mitchell, by developing and refining a grand strategy that reflected the empire’s fragile geopolitical position in the European power equilibrium. It was primarily a defensive grand strategy that emphasized avoiding risks, conserving power, recognizing limits, and preserving the dynasty. Mitchell contends that when Emperor Francis Joseph in the mid-nineteenth century turned away from that time-tested approach to European great power politics the dynasty’s days were numbered. Mitchell, a former president of the Center for European Policy Analysis who currently works in the Bureau of European and Eurasian Affairs at the State Department, begins The Grand Strategy of the Habsburg Empire with a detailed analysis of Austria’s precarious geographical position in the Danubian basin of central Europe. He describes its three subregions: “the mountainous zone of Alpine Austria, semi-enclosed highlands of the Bohemian Massif, and Great Hungarian Plain.” The empire’s heartland was situated between the Baltic and Black Seas and between the west European peninsula and the Eurasian steppe. 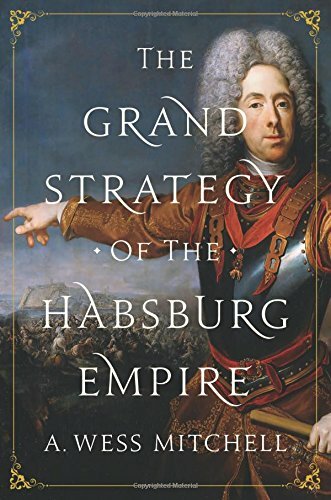 “At its height,” Mitchell writes, “the Habsburg Monarchy covered more than 260,000 square miles … making it the largest continental European power and second only to the Russian Empire in total landmass.” The Danube served as both a barrier and a highway. The Alps and other mountains on all sides of the Danubian basin served as a first line of defense. The empire’s frontiers could serve as gateways to invaders or defensive outposts. Like Edward Luttwak in his books describing the grand strategies of the Roman and Byzantine empires, Mitchell shows how the Habsburgs attempted to integrate military power, diplomacy, fortifications, and road networks in a systemic approach to security in the context of their unique geographical and domestic political circumstances. “Systems thinking,” Mitchell writes, “was inherently defensive, representing a search for means to cope with” both geographical and political realities. This defensive grand strategy involved using the army, fortifications, buffer states, and great power alliances to compensate for internal political weaknesses and external challenges. Internally, the Habsburgs ruled over Germans, Italians, Czechs, Slovaks, Hungarians, Romanians, Ruthenians, Poles, Albanians, Bulgarians, Serbs, Slovenes, Croats, and other ethnic groups. “What made the Habsburg Monarchy different” from other ruling families, Mitchell explains, “was the absence of a dominant ethnic group sufficiently numerous to subjugate the others under a unified language and culture.” The one unifying factor was religion; most of the empire’s subjects were Catholic. Metternich’s diplomatic edifice did not survive him. Mitchell notes that Emperor Francis Joseph gradually militarized Austrian foreign policy, and his intervention in the Crimean War resulted in the end of the Austro-Russian alliance. This coincided with Prussia’s rise under the leadership of Otto von Bismarck, whose policies and brief wars in the 1860s and early 1870s resulted in Prussia replacing Austria as the leading German power in central Europe. Internally, Austria became a dual monarchy with Hungary, further undermining Habsburg rule. Bismarck’s Germany became the arbiter of the European balance of power, reducing Austria to a second-rate or third-rate power. The Austro-Hungarian Empire ended with defeat in the First World War and the subsequent peace that emphasized Woodrow Wilson’s dream of the self-determination of peoples. Eastern and Central Europe lost the stabilizing influence of Habsburg rule. That region of Europe, as Mitchell notes, would become the focus of the Second World War and the Cold War that followed. The American diplomat and historian George F. Kennan would later refer to the First World War as the “seminal catastrophe” of the twentieth century. Francis P. Sempa is the author of books including Geopolitics: From the Cold War to the 21st Century. He is an attorney and an adjunct professor of political science at Wilkes University.